Thai food is pretty popular in our house, whether it be home made or from the local Thai restaurant. But it’s fair to say the following dish is probably not traditional Thai, but is Thai inspired. Extremely healthy and lean it’s something that will fit into your training program diet and won’t add on unwanted kilograms! 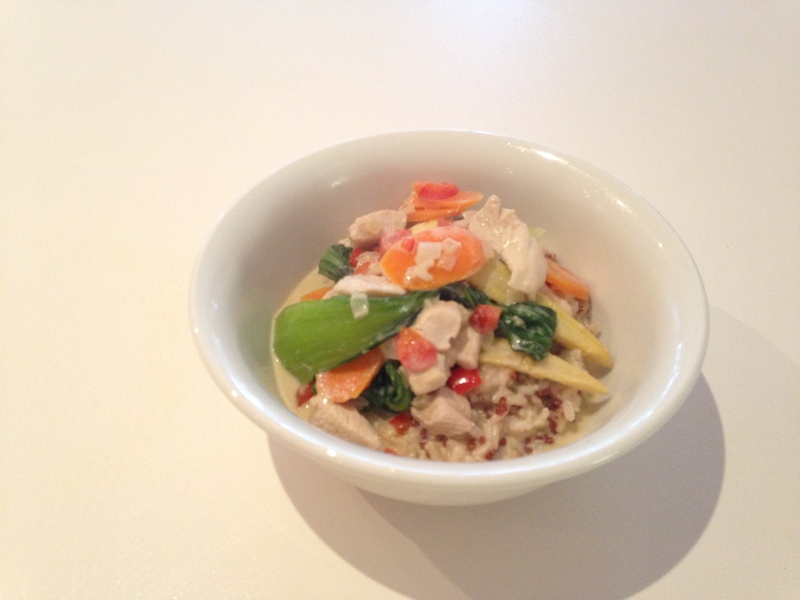 I’ve incorporated brown rice and quinoa to serve with the curry – better for you in all aspects and really tasty. If you are happy to go with commercial Thai green curry paste (as opposed to making your own) you can have this dish on the table in 30 minutes – it’s that simple. 2 cups cooked (steamed/boiled – your preference) brown rice & quinoa blend cooked as per directions. Get the rice and quinoa blend cooking first as it will take a little longer than the chicken curry. Coat a non stick frying pan with cooking oil spray and lightly cook chicken and when almost cooked, stir in curry paste and finish off. Remove from pan when just cooked. Spray frying pan again, add carrot, onion, capsicum and corn and toss on a high heat for 2-3 minutes. Add pak choy and coconut cream stirring constantly. As mixture starts to thicken and pak choy softens add chicken. Cook for 5-8 minutes and then remove from heat. If you want to make your own Green Curry Paste, the recipe below works pretty well. But if time doesn’t permit, a good quality commercial Thai Green Curry paste will do the job. Also, if you want to turn down the heat, just reduce the teaspoons of curry paste and it will tone it down and by experimenting you’ll quickly work out what level of heat works best for you.